Think all of Kansas is flat? Think again. The Flint Hills, in the eastern part of the state, fan out over 183 miles from north to south, stretching 30 to 40 miles wide in parts, the land folding into itself, then popping up in gentle bumps, with mounds looming far off on the horizon. Seemingly endless, the landscape offers up isolated images — a wind-whipped cottonwood tree, a rusted cattle pen, a spindly windmill, an abandoned limestone schoolhouse, the metal-gated entrance to a hilltop cemetery. Proud of the region's beauty, Kansas has seen to it that 48 miles of its Highway 177, leading through the heart of the hills, are designated the Flint Hills National Scenic Byway. This stretch starts about 50 miles northeast of Wichita and leads north to the Tallgrass Prairie National Preserve, one of the few places left in the United States where a visitor can see the grasses that once covered so much of the American heartland. While up to a million head of cattle graze each summer in the Flint Hills' rolling pastures, they're long gone from Wichita, a metropolitan area of half a million people, at the confluence of two narrow curving rivers. But when a strong dusty wind blows through, it's a reminder of the city's roots as a wild cow town. The Flint Hills Scenic Byway winds through almost treeless rolling land where bison once roamed; they have been replaced by prairie chickens, great blue herons, coyote, deer, collared lizards, bobcats and, of course, cattle. The route starts in the tiny ranch town of Cassoday (population 130), where the dirt Main Street has a few weathered 19th-century wooden buildings housing an antiques store and a cafe popular with cowboys, truck drivers and bikers. It then goes through a handful of small towns and past the tallgrass prairie preserve to Council Grove, a former staging area on the Santa Fe Trail. But what this ribbon of a highway offers most is wide-open space. For dramatic effect, visit at sunset when the sky is awash in reds, purples and blues. Of late, tourist amenities have been beefed up in the Flint Hills, especially in Chase County, made famous by William Least Heat-Moon's 1991 book "PrairyErth." 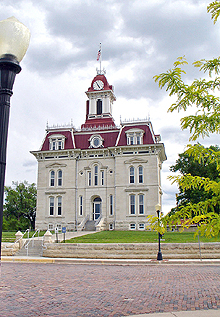 In Cottonwood Falls, with about 1,000 residents, the two-block shopping district is dominated by the grand Chase County Courthouse, the oldest county courthouse (1873) still in use in Kansas (though it is closing today for renovation). Made of native honey-hued limestone with a red mansard roof, it resembles a small chateau. In small shops along Broadway Street, a bumpy road paved in red brick, you can find Western gear at Jim Bell & Son, antiques and art at the Gallery of Cottonwood Falls, and bison burger and chicken-fried steak dinners ($6.95) at the Emma Chase Cafe. One of the town's biggest annual events took place last month, the weeklong Prairie Fire Festival, paying tribute to the annual controlled burning to clear out old dry grass and promote new growth, an astonishing sight of flames sweeping through the hills. But near Cottonwood Falls, there are guided tours of the high open hills available now on foot, horseback, four-wheel all-terrain vehicle and 19th-century covered wagon. 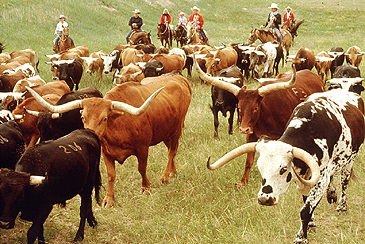 Kansas Flint Hills Adventures offers two-hour tallgrass prairie interpretive tours, wildflower tours and trail rides led by a naturalist who expounds on local history, cowboy culture, American Indian traditions, plants and animals. WANNA-BE cowboys can help out with the chores (or not) at the Flying W Ranch, a 10,000-acre, fifth-generation, working cattle ranch to the west of the byway, off Route 50 in the one-building town of Clements. It offers modern bunkhouse lodging, chuck wagon meals, trail rides, longhorn-roping demonstrations and sunset rides in a 1959 Ford wheat truck. In the summer and early fall, weekend pioneers can pick up the Flint Hills Overland Wagon Train in Council Grove. Riders camp overnight and are duly fed several "pioneer meals" cooked over an open fire. Saturday night's entertainment is a performance of cowboy songs and poems. About 18,000 people a year visit the Tallgrass Prairie National Preserve, two miles north of Cottonwood Falls. It includes 10,894 acres of an almost-lost ecosystem that once covered 400,000 square miles of North America's midsection. The Flint Hills in Kansas — and in Oklahoma — are North America's largest remaining tract of tallgrass prairie. The preserve is at its full glory in late spring, when yellow, white, purple and blue wildflowers pop up amid a sea of green grass. The grass is tallest — about waist high — in the fall. The preserve has over 16 miles of hiking trails through grass dotted with black-eyed susans and coneflowers, groundplum milkvetch and plains indigo. You can take a bus tour or roam around the 1881 hilltop ranch, with a limestone mansion and an impressive three-story barn. Even there, the Flint Hills feel untrampled and unharnessed, quiet enough for a lawless wind to be heard rustling the leaves and grass, producing the unexpected sound of the seashore, of crashing waves and blowing sand. Only 85 miles away, where the land flattens into the kind of pancake terrain more expected in Kansas, is the busy city of Wichita, which once served as a stopover for cowboys driving cattle along the Chisholm Trail from Texas to northern Kansas railheads. Wyatt Earp corralled horse thieves there. Today, Wichita is the largest city in Kansas. Airplane-building is a major industry, with five manufacturers, including Boeing and Cessna. A hotel where Carry Nation smashed whiskey bottles and threw billiard balls is now a loft and shopping complex in Old Town, a gentrified warehouse district. Two rivers — the Arkansas and the Little Arkansas — meet downtown and the surest way to be exposed as an outsider is to mispronounce them. Kansans, understandably, say Ar-KAN-zis not AR-kan-saw. At the confluence of these sleepy Plains streams, near where the Wichita tribe lived, looms the Keeper of the Plains, a 44-foot tall sculpture of a Native American. Not surprisingly, Wichita's big annual event is Riverfest, nine days of concerts, boat races and fireworks — and runs this year from May 11 to 19. The gentle Little Arkansas winds through a quiet residential neighborhood where cottonwood trees shade the riverbanks and people stroll through 118-acre Riverside Park, which fills grassy pockets between the river's bends. Local bohemians hang out at Riverside Perk, a ramshackle coffeehouse with a cowboy/South Seas/leopard lounge/Salvation Army design aesthetic. Several museums overlook the rivers, the most architecturally arresting being Exploration Place, a science center designed by Moshe Safdie with curvy chunks of poured-concrete that swoop up from the river. Inside are Kansas-themed exhibits — about planes, tornados, the wind and prairies — and "Kansas in Miniature," a 1950s-era diorama that fills a 2,800-square-foot room. Accompanied by lighting, animation and sound effects, it offers an engaging presentation of Kansas history, with 125 scale models of classic buildings from Dwight D. Eisenhower's childhood home in Abilene to a humble oilfield worker's house, plus distinctive Kansas landscapes, including the Flint Hills. For nightlife, locals flock to Old Town, begun in the 1990s with the renovation of red brick warehouses on brick streets, and dominated by restaurants, bars and theaters. A more quirky option is out on the range, at the Prairie Rose Chuckwagon Supper, a popular western dinner-and-show 15 miles east of Wichita in Benton, opened in 1999 by struggling cattle farmers trying to hold onto their 600-acre, five-generation family ranch. The drive takes you past fields of wheat, corn, soybeans and grain sorghum, past round hay bales dotting pastures, past what could be Dorothy's house before she was swept off to Oz. The all-you-can-eat meal is delicious (especially the smoked barbecue brisket); the food is served inside a recreated opera hall that's blissfully air-conditioned and fly-free; and the cowboy music is performed by a talented, corny-joke-cracking foursome whose repertory includes "Red River Valley" and "I Just Don't Look Good Naked Anymore." THE Flint Hills area of Kansas runs north to south through several counties of eastern Kansas, in an area once covered with native grasses. A tour there leads naturally to Wichita, the state's largest city, to the southwest. Tallgrass National Prairie Preserve (620-273-8494; www.nps.gov/tapr) offers ranger-guided prairie bus tours ($5) through October. Kansas Flint Hills Adventures (620-342-2625, www.kansasflinthillsadventures.com) offers tours and rides year round; $60 a person for a two-hour trip, with a two-person minimum. Visits to the Flying W Ranch (620-274-4357, www.flying-w-ranch.net) can include modern bunkhouse lodging ($45 a person), chuck wagon meals ($25) and a sunset tour ($10). Another nearby lodging option is the Clover Cliff Ranch (Highway 50, Elmdale; 800-457-7406; www.clovercliff.com) with rooms from $95 to $180. Flint Hills Overland Wagon Train Trips ( 316-321-6300; www.wagontrainkansas.com; $170) are offered several weekends between June and early October. In Cottonwood Falls, the 19th-century Grand Central Hotel (215 Broadway Street; 620-273-6763; www.grandcentralhotel.com) has rooms from $150 to $180. Its white-tablecloth restaurant serves hefty Kansas steaks ($16 to $28). In Wichita's warehouse district, the Hotel at Old Town (830 East First Street North; 316-267-4800; www.hotelatoldtown.com) is a former warehouse built in 1906 with 115 rooms from $109 to $295. Nearby are restaurants aplenty. For lunch or (on Saturday only) breakfast ($4.50 for biscuits and gravy, a Kansas classic), visit the 75-year-old Old Mill Tasty Shop (604 East Douglas Avenue; 316-264-6500), which has a gorgeous marble soda fountain and vintage Wichita photos. For dinner, the Larkspur Restaurant (904 East Douglas Avenue; 316-262-5275), serves Kansas beef ($24 for a 14-ounce Kansas City strip) and not-from-Kansas seafood ($19 for grilled salmon.) Riverside Perk (1144 North Bitting Avenue; 316-264-6464) is an artsy hangout. Wichita museums include Exploration Place (300 North McLean Boulevard; 316-263-3373; www.exploration.org; $8) and Wichita Art Museum (1400 West Museum Boulevard; 316-268-4921; www.wichitaartmuseum.org; $5). At the Prairie Rose Chuckwagon Supper in Benton (316-778-2121; www.prairierosechuckwagon.com), dinner and a show are $25.